Providing our Clients with the Highest quality & mostcost effective solutions for their groundwater resources. WATER WELL SOLUTIONS – Your full service water well contractor. Water Well Solutions Service Group, Inc. is a full service water well contractor. Our main clientele consists of municipalities, industries, agriculture, commercial and other high capacity, multi-well facilities. Water Well Solutions is very proud of our image, and are sure you will be as equally impressed with the quality of our equipment and professionalism. We have enjoyed rapid growth by attracting the best people in the industry. We continue to strive to meet our client’s individual requirements with professionalism and realistic solutions to their ever changing needs. We base our business on trust, and are confident our clients will appreciate our innovative, cost effective, and straightforward approach to all their water needs. 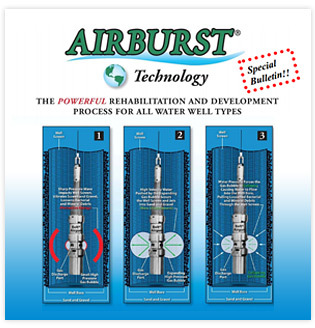 AirBurst®AirBurst® is a proven, comprehensive rehabilitation and development process for all types of water wells. Asset Management ProgramWater Well Solutions offers full service routine and preventative maintenance programs. Hy-Rip®The Hy-RIP® water well rehabilitation services involve a highly effective process that is used in primarily conjunction with chemistry. Well Swaging Repair ServicesOur tools have the ability to accomplish a quick fix to get through a pumping season or a complete well reconstruction. AquastreamAquastream eliminates sand from well water, increases sandfree water output, reduces overall operating costs, and extends well life. Aqua Freed RehabilitationThe Aqua Freed process is a highly effective, environmentally sound method for restoring lost capacity to water supply and environmental wells.